Several years ago, I spoke to a group of extraordinarily bright, committed colleagues from across a group of neighboring colleges and universities in a large metropolitan area. The subject – collaboration — was a precursor to a larger conversation about whether they might consider a merger of like-minded institutions to create huge efficiencies and a clear economy of scale. Their institutions had overlapping programs. They competed fiercely in the regional market. They feared lay-offs and thought they would lose the support of their campus stakeholders. Their alumni would be up in arms even if the new institution were significantly stronger and with a better capacity to brand their education regionally and even nationally. And most important, they argued, their campus culture would object to any changes as an abandonment of their mission. Their arguments made a great deal of sense from each institution’s perspective and from where higher education stood as a community several years ago. Further, we had presented the hypothetical question about merger as an “either/or” option. In addition, each college represented a unique social, economic, political, and cultural climate. Finally, some leaders could choose against mergers because they were doing better at differentiating their programs, establishing a good consumer tuition price point, and establishing a firm toehold in the enrollment market. If we approached these institutions today, we might ask a similar question but phrase it very differently. To start, the financial situation at almost all of the colleges has not improved materially in recent years. Indeed, many face an existential crisis with net tuition revenue flat or decreasing. While some new programs are providing additional revenue, the colleges as a whole do not have robust, well-differentiated programs across the board. The most successful new initiatives are not the core liberal arts programs generally but are more professional in nature. Efforts to grow graduate, continuing education, and online programming may appear to have improved the bottom line, but they are value-added tactics, not systemic changes. Given the economic, demographic, and cultural landscape facing these colleges and universities today, the right question to ask is: how should these institutions create a stronger, better differentiated group of colleges and universities while retaining their historic independence, remaining true to their mission, and enjoying the benefits of brand in the marketplace? Is there a way to “heighten the brand,” become more sustainable individually and collectively, and not anger key stakeholders, especially students, faculty, staff and alumni? The answer may be “yes” based upon how these institutions imagine governance. In their case, what could be proposed is less of a union through mergers and acquisitions and more of a confederation. It is possible theoretically to imagine a new governance structure in which effectively nothing changes. Colleges would maintain their full independence, manage their affairs, fundraise, compete for enrollment, graduate their students with the college’s degree, and build their alumni base. They would employ their faculty and staff. But a new, confederated University would work to create differentiated programs through open dialogue, diminish or eliminate repetitive operations and programming, and work creatively to create new ones to replace older strategies through basic efficiencies in an economy of larger scale. This scale would also permit affiliated institutions to brand themselves better and attach their brand to the larger University. It would not interfere with individual mission, culture, or strategy. In a critical way, a confederated University would bring order from the competitive chaos among small- and mid-sized colleges that would also permit them to compete more effectively with larger universities. In addition, a confederated system of equal, collaborating colleges would draw strength from one another that might stabilize net tuition revenue and grow the enrollment base. It would also encourage new initiatives like graduate and professional programming offered over a wider area and online efforts that could be supported by the better, more efficient resources created by the economy of scale. In short, a confederation would permit smaller colleges to play competitively on a much larger field. The confederation itself would not need to be place-bound but might even cross state lines, depending upon how it developed. One alternative to “we’ve always done it this way” is to pursue an unsustainable path with potentially dangerous outcomes. Mergers and acquisitions may make sense in some settings. It is unlikely that American higher education will ever face a “day the dinosaurs all died” moment. But the present operating models do not work for most colleges. Higher education must experiment with systemic change. Some conversations will go nowhere. A number of colleges will be nimble and agile enough to flourish on their own. But a reading of the tea leaves suggest that it may be better for some colleges to at least consider getting by with a little help from their friends. The failure to grow net tuition revenue is an existential threat to America’s colleges and universities. Most are overwhelmingly dependent upon tuition, fees, and room and board to support the educational program that they offer. Colleges operate with fixed costs in labor, benefits, land, state and federal reporting requirements, and debt repayment leaving only a small set aside for discretionary spending. Added to that are the paper losses that higher education incurs through tuition discounting off the advertised sticker price. While the average discount among colleges is 50% of every potential dollar received, the cold fact is that for many institutions this number is now over 70% of what would be available absent a discount. This is unsustainable. For the moment, most colleges look to expanding their program base, turning often to new programs that meet perceived workforce needs. In one sense, this is encouraging because it forces institutions to adjust their offerings to the needs of the American workforce in a global economy. When done successfully, such strategic academic programs can produce an important new source of revenue. However, it may not be as easy to relate new programming ideas to the college’s historic mission. And it can produce some ugly moments on college campuses as new, sexier programs run up against the turf wars and campus inertia that characterizes some campuses. Further, new program measures may require expertise in areas that are beyond that of current staff. Are most colleges really ready to compete regionally and even globally with the online program capacity of large research universities? Do they have the technology in place or the cooperative partnerships waiting in the wings to pull it off? Further, are they prepared to commit to tenure-track positions or will they rely heavily on the use of adjunct faculty? Before it enters a competitive marketplace, does an under-resourced institution actually know what it does not know? A further complication for many colleges arises when new program ideas are less grounded in the core mission on which many are based – a residential, liberal arts education. In the most ugly settings, a kind of turf war can erupt among groups that understand that a college budget is a rationing tool. Occasionally, colleges approach new, “out of the box” programming through more normal faculty-led channels, greatly improving the chance that the new program will succeed. The real issue, however, is that new program expansion is akin to putting a band-aid on an open wound. The wound may heal, but the remedy may not address a deeper problem that is far more dangerous and systemic. What is needed most in an era of massive tuition discounting is a new, collaborative model that allows colleges and universities the financial space to develop programs true to their mission but relevant to their repositioning in a changing labor market. In the end, it’s all about how colleges compete through collaboration. Thirty years ago, colleges began to look at collaboration in admissions markets, locally and abroad, cross-registration between neighboring campuses, administrative operations, off-campus study, joint purchasing, and even occasionally shared faculty appointments, among other tactical cooperative ventures. Slowly, these approaches found some level of acceptance on college campuses often more noted by fierce turf protection shaped by campus cultural inertia. The good news is that there is a strong tradition of college and university collaboration upon which to build. The difference today is, however, that higher education institutions must now reexamine collaboration as a way to survive and remain relevant both to their historic mission and to the rapidly changing needs of the global workforce. There are precious few discretionary dollars on colleges and university campuses by which to experiment and innovate. Collaboration must be systemic, woven into the very fabric of campus culture and creatively drawing upon opportunities among colleges that have remained dormant because there was no sense of urgency to explore them. A college thrives with the right balance at the intersection of people, programs, and facilities. The solution – and the level of experimentation – may vary among collaborating institutions. Geography, resources, the force of will, and politics may determine the depth and breadth of collaboration. Key stakeholders must look beyond the college gates to shape a collaboration that holds true to individual missions and differentiates the parts as clearly as the whole. In the best sense, it shapes how colleges adjust to a new reconfiguration of people, programs and facilities within a global market. The alternative to a new culture of collaboration is a system that picks winners and losers based on outdated financial models. Some institutions will survive because they are adaptable. Others will have the resources to weather any storms. But for more than a few, the alternative is a steady march past collaboration toward a future full of mergers and acquisitions. While this may be inevitable, there is still enough time to adapt and shape a stronger and more promising future. Will Higher Education Learn from Lessons of Mount Ida College? When its trustees abruptly shut down Mount Ida College, a small, private college just outside Boston, they unleashed a debacle that resulted in a torrent of criticism and considerable finger pointing. Rejecting a merger or acquisition (depending on the characterization) with Lasell College, the trustees opted to sell the campus to the University of Massachusetts at Amherst, whose leadership saw the location in the middle of Boston’s high technology belt as an opportunity. UMass Amherst also assumed all of Mount Ida’s debt. According to UMass Amherst officials, the acquisition permitted them to find a location that would assist their students who held internships with Boston area companies, among other benefits. Mount Ida’s students (and their parents) were caught off guard and speculated openly and angrily about where and even how to continue their education. Transferring to the UMass Dartmouth campus – about 50 miles away – made little sense to students who chose the bucolic, suburban Mount Ida campus for its fit, programs, and location. At their last Commencement, students successfully banned the trustees and president from attending the ceremony. The backlash increased as UMass Boston weighed in on the closure. Many at the Boston campus saw the acquisition as an infringement by UMass Amherst on their territory. More significantly, they faulted the UMass system for failing to advocate more directly for the UMass Boston campus as aggressively as for the Amherst flagship. Local newspaper columnists openly criticized the UMass administration for a lack of transparency and for failing to listen to UMass Boston faculty and staff on this and a wide range of other issues, including the collapse of a recent search for a chancellor for the Boston campus. As the navel gazing begins, Massachusetts Attorney General Maura Healey has opened an inquiry into Mount Ida’s closure, suggesting that additional regulations may be needed on private higher education to prevent these kinds of messes from occurring again. Richard Doherty, president of the Association of Independent Colleges and Universities of Massachusetts (AICUM), has argued that Mount Ida’s failures were specific to that institution and should not be extrapolated to produce more regulation for the other private colleges and universities in the state. What a mess – on several levels. Let’s set aside the finger pointing and the effort to condense a slew of bubbling frustrations and emotions into a crisis that shapes bad public policy. Is there anything that can be done to right the ship? There is, beginning with the understanding that Mr. Doherty is correct when he argues that Mount Ida is one incident and not a more damaging trend. The failure at the core of the controversy seems most clearly to be a failure by Mount Ida’s trustees to lead. Mount Ida’s trustees did not exercise appropriate, conservative fiscal oversight of the institution. Further, they permitted the college’s financial mishaps to drive the timing and the transparency that led to the closing and resulted in the public implosion and outcry. Second, the accrediting agencies should have known more about the condition of the institution. When accreditation works well, it’s always a better alternative to state and federal oversight. The fact is that we need better predictive, analytical tools by which to measure financial health across peers – even if only confidentially for internal institutional use – to determine in consort with accrediting agencies the true financial picture. Knowing earlier will better prevent future debacles like Mount Ida. Third, we need new products and approaches to assist colleges to help ease the inevitable. It is likely that colleges and universities will be forced to cooperate more to improve efficiency and create economies of scale. This is especially likely among small- and mid-sized private colleges and universities. It is apparent that there will be an uptick in mergers, acquisitions, and occasionally, closures across America. Higher education needs an orderly process and a clear pathway to cause minimum disruption for students. State governments can help by working to develop new programs like catastrophic insurance that will address how to handle closures, including the disposition of assets, laid off employees searching for work, and displaced students seeking to complete their degrees. This is especially true if colleges have a reasonable financial stress test against which to measure the need for additional insurance. Fourth, when public universities play a role, we need a better understanding of regulatory authority. For issues that cross campus lines within a system, the central administrative offices must have more authority to say yes – and no – over how debt shapes opportunities and challenges across the system. Finally, beware of state regulators applying a uniform standard developed from a self-inflicted crisis. Government operates on an annual appropriations cycle in most places. Elections further shape how long-term strategy – if any – gets made. The right kind of regulatory assistance – like catastrophic insurance – makes sense to explore. Intruding deeper into the management of colleges and universities – especially private ones – is unnecessarily bureaucratic. Let’s hope that we learn the lessons of Mount Ida. It would be a shame to see a sad moment become a harbinger of worse things to come. What Will it Take for Higher Education to Adjust to Market Conditions? In our new book, How to Build a College: A Practical Guide for Trustees, Faculty, Administrators and Policymakers, Dr. Joey King and I argue that the sky is not falling around higher education. By and large, colleges and universities are nimble and resourceful institutions, most of which will prosper in the 21st century. However, college and university operating models that rely overwhelmingly on tuition and debt for their revenue are broken and unsustainable. Change – whether determined internally or forced by outside conditions – is coming. Many institutions are making changes to adapt to their new realities. The question is: Is this change systemic and sustainable enough to strengthen America’s colleges and universities over the long term? It’s increasingly clear that college stakeholders are creating new efficiencies and shifting some financial responsibilities across their operating budgets. This a good first step, one that has been going on for at least 20 years at the better-managed institutions. Further, many colleges and universities band together through cost sharing to develop new efficiencies in programs and operations. But these admirable efforts are first steps. They do little to change campus climate. Most colleges and universities report stable or decreasing net tuition revenue. At tuition-dependent colleges, particularly at smaller privates and second- and third-tier publics, the impact is effectively to shut off the most reliable source of support. At public institutions, the inconsistency and uncertainty of state and local contributions further exacerbate their problem. The effect is to limit investment, except through the issuance of new debt and fundraising, upon which many of these colleges and universities depend to make upgrades that keep their programs and facilities attractive. Another solution is to sponsor new academic programs. These programs are often a good idea since many respond directly to local and regional workforce needs. But they incur substantial start-up costs, require a multi-year commitment, and sometimes draw upon already scarce resources. Fundraising for new programs can help a little. But most colleges and universities will increase the draw from their endowment – if they have one – or turn to temporarily restricted funds to execute and assess their new programs. This can be a solution, but it depends on the quality of the market analysis, the strength of external partnerships, and the commitment from the faculty and staff. Colleges often sponsor these new programming efforts by expanding the areas of their outreach. Specifically, they build new or expanded continuing education, graduate, and professional programs. The danger is, of course, that these programs become cash cows of poor quality with a limited shelf life. Unless implemented thoughtfully, they may detract from the mission of the institution and diminish its reputation and standing. Often staffed by adjunct faculty, many new programs lack the depth of services that supports student retention, especially for traditional students at residential liberal arts colleges. They can be a temporary fix, but they seldom reach their full potential. Does the college have the in-house expertise to support online programs? If not, is their choice of an online partner a good one? Can the college compete effectively in a world where large research universities with broad brand recognition play on the same field? Is there an opportunity for a cooperative venture between different types of institutions? In the end, colleges and universities often face limited choices for improving their bottom lines. It is most likely that some combination of heightened internal efficiencies, cooperative ventures, and a re-imagination of how a college’s operating budget is put together that provide the best recipe for a path to sustainability. This will require two changes at most institutions. The first mandates a review of how colleges operate. Is it possible, for example, to imagine real estate as an asset? Can colleges and universities think more realistically about what a fully-owned facilities footprint might look like? How much of it can be its own land with facilities operated by third parties that are better equipped to operate in the security, food service, or hospitality business? Perhaps the more greater challenge is that higher education institutions must look outside their own industry for possible solutions to their current dilemmas. What lessons can be learned from other industries facing similarly rough transitions from 19th century program and facilities models? Are there new analytical, financial, financial aid, insurance, and student life programs and products that can be developed to suit 21st century needs? Can working relationships emerge with new partners, especially on the corporate side, that add value to support well-defined college missions? In doing so, does the case for higher education change in ways that resonate better with American consumers while still retaining the underpinning of the liberal arts? Change is coming. Higher education must shape its future or be washed over by the cultural, social, and technological changes swirling around it. Our bet is that American higher education will find its way. The following essay was published in the Boston Business Journal on April 13, 2018. The catastrophic closure of Mount Ida College in Newton [Massachusetts] has everyone, especially Mount Ida’s students, wondering what happened. Parents, faculty, staff, trustees and donors feel betrayed by the abrupt closure. What is going on? Moody’s recently warned that the number of college closures and mergers would triple between 2017 and 2018. Private higher education is especially vulnerable to the four horsemen of the higher education apocalypse: galloping debt, spiraling deficits, unfunded deferred maintenance, and out-of-control tuition discounts. Many of our colleges are borrowing and spending more money than they take in. We applaud Gov. [Charlie] Baker for calling for an inquiry of the decision by Mount Ida’s trustees. We believe that it is time for the Commonwealth of Massachusetts to lead by monitoring institutions that depend so heavily upon federal and state dollars. Insure colleges and universities against catastrophic closure. Colleges are businesses with increasingly limited lifespans. By pooling risk among institutions, students and citizens will be protected from the often unforeseen consequences of catastrophic closure. After the College of Saint Catharine in Bardstown, Kentucky, closed in 2016, the bondholders hired a litigation firm. They sued any former student who held a balance, from unpaid tuition to a parking ticket. The judge added a kicker, adding 12 percent interest to those unpaid balances over the course of 10 years. The results of that have been disastrous. Use a valid stress test to monitor the fiscal health of colleges and universities. The U.S. Department of Education issues a list of colleges and universities that failed to maintain stable financial composite scores annually. Financial Responsibility Composite Scores determine a college or university’s financial health and qualify them to receive federal aid under Title IV. Based upon a now outdated method of ratio analysis once used to predict corporate bankruptcies, these composite scores are unreliable, outdated and prone to manipulation. In August 2017, the General Accountability Office issued a report entitled “Higher Education: Education Should Address Oversight and Communication Gaps in Its Monitoring of the Financial Condition of Schools.” The GAO warned USDE that composite scores are famously unreliable barometers of stability that are sometimes “gamed” by unscrupulous institutions. Find ways to address the coming tsunami of unfunded deferred maintenance. The quality of facilities is often ignored when budget decisions are made. Unless an institution is using a “plus 10” (+10 percent of capitalization) formula to fund ongoing maintenance of buildings and grounds, most colleges and universities have unfunded maintenance costs totaling at least $100 per gross square foot of constructed space. Some smaller institutions are carrying deferred maintenance of $50 million or more, causing students at Brooklyn College, for example, to rebel at their condition of their facilities. Find innovative ways to give tuition-dependent colleges and universities access to capital markets. Public bonds, private bonds, and hybrid financial instruments now make it possible to repurpose crumbling buildings. Real Estate Investment Trusts (REITs) enable colleges and universities to fund building projects. Some colleges and universities, like Marygrove College in Detroit, have turned their buildings and grounds over to land conservancies. Still other institutions have used equity or sale/leaseback agreements, which exchange a deed or title for uncapped portions of a property’s fair market value. Brian Mitchell is a principal in Academic Innovators and past president of Bucknell University and Washington & Jefferson College. He is co-author, with W. Joseph King, of How to Run a College: A Practical Guide for Trustees, Faculty, Administrators and Policymakers. Gerard O’Sullivan is a former provost and dean, CEO of Corvus Education LLC, and Visiting Professor of Higher Education at Immaculata University. Who Should Public Flagship Universities Educate? Many public research universities face a dilemma: How do you balance a commitment to educate in-state students with the value that out-of-state applicants contribute to the university? As Nick Anderson illustrates recently in the Washington Post, the facts are clear. Public (and private) research universities contribute mightily to a state’s economy, providing a better educated workforce and serving as a principal economic engine, an incubator of new ideas and industries, and a contributor to the social and cultural climate of their states. In a knowledge-driven economy, the role of research universities has become even more important strategically to states seeking to adapt their citizens to the demands of a global workforce. Anderson notes that out-of-state students: “ . . . diversify campuses, bringing fresh perspectives and life experiences. They fill seats in states with stagnant or declining population. And of course, they pay more.” The latter is especially telling given declining state support for public colleges and universities in the 21st century. As Mr. Anderson reports: “Those from elsewhere bring revenue that helps support that discount (enjoyed by in-state students) . . . College Board data shows that tuition and fees for in-state students at public universities this year average $9,970. For out-of-state students, the average is $25,620.” This $16,000 difference is significant but also carries with it some obvious political drawbacks. In a number of states, there is ongoing discussion about giving too many seats away to out-of-state students or even students from economically advantaged sectors of the state. In Virginia, this decades-old debate regularly extends to how many students to accept to the University of Virginia from Northern Virginia — specifically, Fairfax, Loudon, and Arlington counties — where well-prepared applicants seek admission. It may be that public sector leaders are incrementally changing their enrollment recruiting policies based on their need to find revenue lost in recent state appropriations. At the same time, Michigan’s in-state share of freshman has declined from 64 percent in 2006 to 51 percent ten years later. There is an obvious benefit, especially if states retain college-educated graduates after commencement, including those from out-of-state. It certainly improves the employment outlook for prospective employers and those seeking to remain, expand, or relocate to the state. It may also be that public sector recruitment policies depend on where you sit at the table. In the Washington Post story, those with the largest decrease in in-state freshmen were from disproportionately small states – Vermont, Alabama, North Dakota, Delaware, New Hampshire, Mississippi, Rhode Island, West Virginia, South Carolina, Oregon and Arkansas. When you combine small or stagnant population growth with erratic state appropriations, it makes sense to tap students from neighboring states or even nationally where there is a much deeper prospective student applicant pool. There also appears to be a second group seeking to maintain a 50/50 balance in their entering classes. These states often have large research universities and complex state political environments. They include states like Michigan, Colorado, Pennsylvania, Arizona, Indiana, Wisconsin and Kansas. If all politics is local, it may be that many of these public research universities face an optics problem since the purpose of public universities historically was to provide first-generation students with access to a college education. Today, there is no significant socio-economic differentiation in first-generation students, whether at public or private colleges. Outliers. like the University of California system, the University of Texas, the University of Florida, and the University of Georgia, seem to be more a response to the size of their large in-state applicant pool or the development of unique scholarship programs that encourage in-state students at public universities. State programs like free college tuition in public universities may further change the mix in states like New York and Tennessee. It’s simply too early to tell what the long-term impact of these new programs might be. Whatever the future holds, there are a number of conclusions. First, state policies vary widely and are further affected by demographic changes occurring within the state. Second, in most states, the optics matter as public universities continue to wrestle with how to provide reliable, sufficient access for in-state applicants to public universities, especially flagship research institutions. Finally, the impact on higher education, including private higher education, is unclear as public universities broaden their applicant pool with strategies and tactics to support them that mirror the recruiting strategies of their private counterparts. In the end, change is inevitable. It will be important to watch the impact on non-flagship publics, community colleges, and private institutions as a multi-dimensional chess game plays out in a declining applicant pool. Inside Higher Education just released its annual “Survey of College and University Presidents.” The results, which cover a wide variety of topics, are revealing if not surprising. There are too many individual findings to discuss in a single article; therefore, we’ll concentrate on the findings that deal most directly with the state of higher education as an industry and the health and sustainability of its institutions. Collectively, the survey findings suggest that college presidents are worried about higher education’s fiscal health, deteriorating public perceptions of American higher education, and enrollment stabilization and growth, especially at tuition-dependent institutions. One of the most striking aspects is that the survey did not reveal wide swings in college and university perceptions on these issues compared to previous years. The levels of concern remain high, likely indicating that these issues continue to be deeply troubling to leaders, but no single issue rose to the top. That having been said, the survey responses forecast continued uncertainty about the future of higher education. Concern over mergers and closures relates directly to the financial health of the various sectors of higher education. On this issue, the results stabilized when compared to the wide swings of previous years. But there were differences across institutional sectors (e.g. public, private, community colleges, flagship, regional). Private college presidents are the most confident in the viability of their institutions over the next decade. There was renewed hope, especially among private four-year college leaders, in the ability of their own institutions to be sufficiently nimble and adaptable to be sustainable going forward, an encouraging sign from previous pessimistic assessments. One especially interesting finding questioned which sector was believed to have the most sustainable business model. The presidents identified wealthy elite private colleges and universities and public flagship universities as the best able to withstand uncertainty. Apparently, survey respondents did not share the confidence of private sector presidents, for instance, when judging the sustainability of small, private colleges as a sector. The survey respondents believe that the public has been swayed by misperceptions about them. IHE noted: “Asked to assess which of several factors were the most responsible for declining public support, 98 percent of the presidents cited ‘concerns about college affordability and student debt’.” Other factors identified were the greater need for career preparation for students, perceptions of liberal political bias, and, to a much lesser extent, an under-representation of low-income students. These responses imply fairly strongly that American higher education has an optics problem. It continues to play defense rather than move forward on several fronts with an aggressive response to perceived misconceptions. In part, it comes down to higher education leaders’ — such as the presidents surveyed — capacity and willingness to speak out. IHE reported: “Asked whether they had responded to the turbulent political movement in 2017 by speaking out more on political issues, 55 percent said yes and 45 percent said no.” There was also little sense of introspection on whether there was much truth to negative public perceptions. Finally, there continues to be a high level of concern among college and university presidents about their ability to meet enrollment projections. IHE noted: “eighty-two percent of presidents described themselves as either ‘very’ (42 percent) or ‘somewhat concerned’ (40 percent) about meeting their institution’s ‘target number of undergraduates’.” These numbers were down from previous years. In this year’s survey, presidents worried about retaining students and finding enough full-pay students to subsidize institutional financial aid. Inside Higher Education’s survey remains a valuable annual “pulse check” for higher education. The results this year suggest that, while the concerns remain the same, college presidents often perceive that the clouds are more ominous over the other types of institutions and for higher education generally. There is an open question about how contemplative and self-reflective higher education is about itself. And there is clearly concern about how politics and public perception affect higher education policy and overall sustainability. The cumulative effect of the survey results suggests that higher education is in a period of steady transition. American colleges and universities are reaching for every means through which they might increase net tuition revenue. Net tuition revenue is the revenue that the college takes in from tuition after factoring in (i.e. deducting) all institutional financial aid. The harsh reality is that net tuition revenue is flat or decreasing at many institutions. Since tuition is the principal source of revenue for these institutions, this is an increasing problem. Put simply, a college cannot continue to exist without sufficient revenue to meet its expenses. In the short term, colleges may be able to rely on one-time donations, increases in the annual fund, a higher endowment spending rate, or the use of temporarily restricted funds, but in the end, the financial health of almost all is heavily dependent on how much tuition they bring in each year. Since national demographics work against higher enrollment levels from the traditional applicant pool of 18-22 year-old first-time students, an institution must now rely on other means to pay the bills. Some look beyond the traditional pool of full-time, first-time students, working to build their transfer population or full-pay international students. But the transfer pipeline is hardly seamless and the optics of rising tuition sticker prices work against transfers, who often attend less expensive community colleges. In addition, the policies of the Trump Administration cast a long shadow over the ability of colleges and universities to plan the size of their international student population with any certainty. How best to create a robust admission pool from which to draw remains a thorny problem, but it’s important to institutional health. Colleges and universities rely on strong enrollments to right size their institutions. This means, in part, accounting for “stop outs” and “drop outs,” who diminish the size of their student body. If retention figures are not steady, or better yet improving, the impact on an institution’s bottom line can be dramatic. The need for predictable student retention creates an alliance among enrollment, academic affairs, and student life professionals. Higher education institutions — and many of their accreditors — place special emphasis on improving retention to become more sustainable. The problem is that it sometimes becomes more of a numbers game. Student affairs staff provide a plethora of programs and opportunities for students to connect. They work individually to support students who are homesick, unengaged, or dissatisfied with the campus environment. But what they often miss is that first link that should be made between what the school offers and what prospective students want. It is not enough — indeed, it is unsustainable — for the student affairs budget will provide support for clubs that represent the whims of students at a unique moment in a particular class. Succeeding generations may not sustain the passion of students focused on a singular interest in later years. Further, the college or university may not be able to justify a growing roster of club and related activities. No matter how wealthy, a college cannot support everything that each student might want to do. What will be required in the future is a more orderly, systematic, and systemic approach to student life tied directly to enrollment strategy. At the moment, most colleges enroll students because of the quality of their academic programs, if these are defined, well-respected, and differentiated from competitors. But students live on a campus that is defined both by the classroom experience and the thousands of teachable moments that occur each day outside of classrooms and laboratories. They may have institutional reputations as Christian colleges, outdoor environmental programs, the home of Greek life, and liberal or conservative, for example, that appeal to a certain type of student. The best example is how students attract their student athletes into well-regarded athletic programs. For generations, colleges have attracted athletes because athletics offers a unique, idiosyncratic experience for teammates. An athletic team is a “new home,” where students associate with others with similar passion and interests. For student-athletes, the culture of an athletics program will — in many respects — determine fit, and correspondingly, improve overall retention numbers based on this fit. Enrollment officials should see their student affairs colleagues as a kind of front line on retention. It may be that much of the retention problem could be solved if student life worked more carefully with enrollment. Student affairs must define not what current students want so much as how enrollment can attract students on the basis of what enrollment determines will be most attractive to prospective applicants. Is it more useful for a college to have an equestrian team in an urban setting or a gospel choir that reflects the college’s efforts to recruit in urban areas? Should a college invest in a marching band if research demonstrates a demand for this kind of activity among prospective applicants? These efforts to link enrollment strategy to shape student life to recruitment can have innumerable benefits. Like athletics, co-curricular student life offerings provide students a home-away-from-home and outside of their classroom experiences. It makes the fit possible. Students experiencing a good “fit” are more likely to stay enrolled, boosting retention. And retention is perhaps the best predictor of how to increase the bottom line by growing net tuition revenue that every college desperately needs. American higher education is a complex, decentralized, and interlocking network of institutions that provide education to a disparate group of learners. Historically, many of the fundamentals build around an applicant cohort of 18- to 22-year olds. The demographics of the 21st century predict that this group will not be able to support a robust pool of potential students into the future. For many colleges, the choice is to expand the pool, both geographically and to better reflect shifting demographics. College administrators, seeking an admitted student population that mirrors the ethnic, gender, race, and religious characteristics of the country, generally work to open fresh applicant streams from among historically disenfranchised groups. It is new territory for many schools in which campus culture supports these efforts intellectually but wrestles with the cost, preparedness, and internal dynamics of the cultural change required to maintain recruitment standards and retention and graduation rates. Those colleges relying upon the 18-22 year old pool of applicants have little choice. From a financial perspective, these institutions have always relied upon wealthy, full-pay families to provide much of the revenue to support financial aid for needy and deserving students. The problem, now growing into a crisis over the past twenty years, has been that the recruitment and retention costs for each class now exceed the capacity of the institution to balance full-pay revenue with the needs of less fortunate students. A dramatic rise in unfunded aid – translated into the college’s discount rate – has sapped the financial strength of many institutions. The hard truth is that a college operates with fixed costs – heavily tied to labor, land, debt, and financial aid – that permits little left in an annual budget for discretionary moves that might offset these alarming trends. At a growing number of institutions the discount rate is now over 70 percent. What industry – or any financial enterprise – can operate on 30 percent or less of the revenue that it advertises as its sticker price for the product that it delivers? Another problem vexing colleges is the sticker price. Trinity College (CT) just announced a comprehensive fee (tuition, fees, room and board) of $71,660 for next year. Trinity is an outstanding college where students receive an exceptional education. But the optics look terrible for those colleges and universities that cross the Maginot Line of $70,000 per annum. It is difficult and sometimes impossible to argue affordability when the sticker price is confused or equated with with the bill that students and their families actually pay. Does a high sticker price limit the size of a potential pool regardless of a college’s policy on generous financial aid? The first is to increase the financial aid budget to offset increases in a college’s sticker price. This seldom works, especially over the long term. It is difficult to be less generous to successive classes without an enrollment strategy that matches financial aid to changes in enrollment practice. The most nimble colleges have a well-delineated financial aid model that links their enrollment practices to where they want to be in out years. But most institutions seldom follow through, effectively decreasing net tuition revenue over the long term and raising the discount rate higher. A second option is to shift the financial burden to students, generally in the form of increased loans. The problem is that many students see debt as a responsible way to pay for an education, whatever the level of debt incurred. The result is that many students unskilled in handling debt become subject to it. The result is disastrous and often leads to higher default rates among students, many of whom fail to graduate, who work at jobs that do not permit them to repay debt that they did not understand when they agreed to its terms. A third option is to rely on support from states and the federal government. The trends work against students here. Government support for student aid and debt relief has been – put kindly – spotty at best. Further, governments at all levels are losing their discretionary ability as pressing fiscal and political priorities affect their discretion. There may be a point at which discretion and government regulations intersect with hard choices ahead for those who seek state and federal aid. America’s colleges and universities should assume that any solution must be organic and come from within the higher education community. The discount rate at many colleges is now approaching a tipping point. It’s not that colleges and universities face massive, wholesale closures. It’s more like death by a thousand cuts in which closures increase steadily but without a classic catastrophic event that shakes the college and university community to produce the next generation of operating changes necessary to survive. It feels a little like being the lobster in the pot brought to a boil. When you fully recognize the danger, it’s already too late. The task ahead is to plan for an orderly review of how to prepare for an uncertain future and how best to pay for it. This return to negative ratings reinforces a number of trends that bear close review. The comprehensive fee – tuition, fees, room and board – will approach $70,000 a year at a number of high sticker-priced colleges and universities. Students and their families are voting with their feet, with 46 percent of first-time students beginning or having had some experience in community colleges. Politicians sensitive to anecdote or polling or simply worried about the price of a higher education degree, promote policies that reinforce this optic. Recent efforts to tax wealthy endowments to skew higher education spending priorities, often towards demands for moderated tuition or increased financial aid, illustrate this point further. Higher education has taken some steps. Efforts have been underway to trim rising costs and achieve basic efficiencies since the Great Recession. These efforts vary widely depending upon the urgency felt within an institution, its level of creativity and nimbleness, shifting demographics, and the relative strength of the net tuition revenue it receives. Trimming costs or enrolling more students, however, cannot cure what higher education faces. America’s colleges and universities have a revenue problem. Fixed costs in land, labor, and debt repayment and rising costs in health care and financial aid largely determine a college’s operating budget. Labor alone might be sixty percent of a typical small college’s budget. Most colleges are heavily tuition dependent. There is little or no discretion in the operating budget. For some of them the financial aid discount rate now approaches seventy percent. Dorms will be full until the institution, desperate for revenue, closes, merges, or is acquired. Many of these colleges rely on other sources of support. Auxiliary revenue sources like residence and dining hall fees cover some of the territory lost to declining tuition revenue. Endowment income also helps, but most colleges do not have sufficient endowment revenue to make a significant difference. Comprehensive campaigns and research grants and contracts address longer-term needs but do little to fund short-term revenue problems. The truth is that colleges rely on an older, archaic operating model where tuition increases historically matched expenses to balance an annual budget, often aided by auxiliary services revenue. For many schools, it was that simple. As new financial, cultural, demographic, consumer, and program pressures build, these “Mom and Pop” shops do not have the flexibility or capacity to meet the new demands. College governance is weak and ineffective and must be immediately adapted to meet new oversight demands, with the faculty playing a more important role in creating an innovative educational enterprise. Colleges must understand the institution’s value proposition, if the mission is still relevant and differentiated from its peers, and where the college wishes to be in out years. Why should the college exist in the 21st century? The “Mom and Pop” operations must give way to a newer, more flexible model that accounts for changes in how colleges use tuition, re-imagine underutilized real estate assets, re-configure capital campaigns to meet shorter-term needs, re-think the use of temporarily-restricted funds, and seek additional partners to produce new revenue streams. Higher education institutions must set aside older enrollment strategies in favor of newer financial aid analytical models that differentiate academic programs, emphasize student life, expand when practical the traditional 18-22 year old applicant pool, and focus on outcomes through stronger career counseling networks that create a lifelong affiliation. Stakeholders must work much more aggressively at retention and graduation strategies, using student life, including athletics, as an enrollment tool to increase student fit and the level of satisfaction. Colleges must determine what facilities footprint the institution can afford. Its leadership must grow/shrink the college to create a better fit among people, programs and facilities. Institutions must get out of those business arrangements that are eating up financial capacity for which there are better service providers. If the college can use its legal, accounting and student life teams to create a robust residential life program, for example, does it really need to own its housing, with its corresponding debt, that might otherwise go to academic support? The campus community must think of technology as an ongoing operating lease rather than a draw against remaining levels of debt capacity. Its supporters must remember that a college is both an educational enterprise and an economic engine for its region, and seek strong public private partnerships to mutual benefit. Despite the dismal forecasts, the decentralized and complex higher education system remains a cornerstone of American ingenuity, creativity and promise. The task ahead is to imagine the possible. This op-ed first appeared on The Hechinger Report, a nonprofit, independent news organization focused on inequality and innovation in education. Will Higher Education Heed Bond Rating Agency Warnings? Moody’s and Standard & Poor’s recently released their updated outlooks for American higher education. The news is not good. Moody’s expects private institutions to outperform their public sector counterparts. But about 15% of universities will be forced to cut costs in response to stagnant or weak revenue growth next year. The ratings agency believes that support from tuition and related fees, research funding, and state appropriations will remain weak. Further, net tuition will be depressed over affordability concerns and slow enrollment growth. While private universities will have revenue growth of about 3% – 3.5%, these numbers will be considerably less robust in small- and mid-sized colleges and universities. This is especially dangerous since so many of them serve low- and moderate-income students. They draw from the same regions in which the students and their families live. Moody’s notes that the recruitment demographics are horrible and that higher education is subject additionally to changes in its relationship with the federal government. Moody’s speculates that federal tax reforms, the levels of research support, and changes to the Pell Grant and subsidized federal loans in the future could profoundly impact affordability and access. Standard & Poor’s makes a similar finding. Presented as grim, the S&P outlook finds that higher education’s flexibility “in programming, financial operations, enrollment, resources or student draw” is limited. Like Moody’s, S&P cited the recent federal tax on colleges with large endowments, together with growing consumer skepticism and demands for lower sticker prices and more effective services. Significantly, Standard and Poor’s also warned of lasting damage to college and university reputations in the current political climate. S&P offered some encouragement, however, finding that higher education institutions could improve their standing if they established new partnerships, peeled back their reputation for cultural inertia, and increased their efforts to recruit non-traditional students. Mr. House reported that the common agenda driving the future of higher education in the S&P and AASCU positions is a call for innovation. He further suggested that colleges could grow their student body by serving more post-traditional students, enhancing strengths and partnerships, embracing data analytics, technology, and online learning. For those of us who work at imagining ways to strengthen American higher education, these are good and necessary tactics. But by themselves they are insufficient, roughly equivalent to the proverbial Dutch boy plugging the holes in the dike. Further, it’s not so much that the dam threatens to break but more that consumers will find new, alternative ways to find and use the water effectively. The success of American higher education will depend heavily on innovation. That’s why the warnings from Moody’s and Standard & Poor have special urgency. Those institutions that are the most adept and nimble will likely craft the best path to sustainability. It starts with these colleges and universities developing a clear value proposition and sense of self. That’s quite different from remembering their history, although working their history and traditions into their value proposition is unmistakably necessary. What’s most needed is a sharper strategy that combines principle and practicality. American higher education must anchor a seamless pathway to a lifelong education that prepares Americans for rapid change in a global economy. It must bridge the chasm between formal education and employment by preparing its graduates with a worldview that is able to imagine their contributions to society. But strategy alone is insufficient. The plain hard fact is that higher education operates on a mid-20th century business model that is unable to anticipate 21st century changes. Many colleges and universities run like the “Mom and Pop” corner variety stores that ultimately failed because they could not compete and adapt as the world changed. For them, it was more about a failure in process and delivery than in the quality of the product. Indeed, the biggest obstacle facing American higher education is the cultural inertia that permeates many campuses to reinforce an antiquated, incremental business model. Can the business side of higher education keep up with the educational innovation that now energizes its research and teaching? Can U.S. Higher Education Disrupt Itself Before It’s Too Late? I’ve been thinking a great deal lately about how disruption will play out in American higher education. My hopes – and concerns – reflect a bedrock belief that America’s colleges and universities operate on an unsustainable finance model that must adapt to new realities. It is impossible to predict how many colleges and universities have the capacity or willingness to make the kinds of structural changes that reach beyond where most have charted their courses. That having been said, it seems likely that we will see an uptick in mergers, closures, and acquisitions, particularly for poorly endowed and under-resourced institutions that cannot control their financial aid discounts and spending rates. While almost all institutions feel some level of pain, those with weak governance, internal fiefdoms that fail to communicate across the campus, uninformed faculty, and poorly articulated value propositions will be the first to fall. External forces compound the growing problems faced by higher education, where the annual outlook by the ratings agencies has now eroded once again to “negative.” There are a number of quality institutions with financial aid discount rates over 70 percent. A number of these institutions are unable to stop the rise in these rates. Basic math suggests that as the effects compound, these institutions will so severely limit their options that the impending question on the horizon is how and when they will lose their independence. In the once robust world of decentralized American higher education, the tragedy is that so much of what will play out could be stopped. There are a number of players who can step in to avoid the debacle ahead. The first is, obviously, the higher education community itself. Each and every college or university must determine its value to its community and to American society as a whole. Once defined, its leadership must be courageous in articulating its own value proposition. Stakeholders – led by trustees and faculty – must accept this value proposition and must adjust their roles accordingly, clearly differentiating what is truly distinctive about their institution – what it does differently than its peers. The campus community must live within its footprint. And it must adapt to the new realities that fund what it can do best within its means to serve the common good. The second stakeholder group is government, both at the state and federal level. There has never been an effort to have the state and federal governments coordinate their support, especially their financial support, of America’s colleges and universities. The impact varies widely across states. Is it the responsibility of state governments, for instance, to bolster student aid and infrastructure needs rather than simply provide direct public subsidies? Should the federal government effectively designate America’s research universities as the lead participant in many strategic national research and development efforts? Can the federal and state governments lighten regulatory restrictions in an overregulated higher education industry? The third stakeholder group is the media through which the message about higher education is delivered. Much of the negative perception of education shared by American consumers comes from the sensationalism of anecdote, political posturing, and polling. It festers in an unregulated, hyperactive, and reactionary social media environment. Good stories seldom draw ratings and sell print media. This combination of ratings-driven establishment and out-of-control social media has encouraged new – generally negative — perceptions not driven by data. The cumulative effect is to throw higher education under the bus, often through some combination of bad data and self-inflicted wounds. The positive message of higher education’s contributions to the common good in American society is often drowned out by sensational, if often accurate, stories of colleges in crisis. The weakness of its parts effectively drowns out the good of the whole. Can Disruption Restore Public Faith in American Higher Education? This is the point at which disruption can play a critical role in restoring the faith of the American consumer in the value proposition of American colleges and universities. As disruption sweeps across colleges and universities, higher education is facing the same kinds of pressures as the health care industry. If higher education, government, and the media that together shape the parameters of higher education continue with their current level of disconnected incoherence, the results may work against a robust college community. America loses in the end. However, there is an alternative view. Led by America’s colleges and universities, disruption within higher education can be good for American society – especially if it is intentional and self-directed. Higher education must break out of the “we’ve never done it this way before” mindset that governs broad national policy despite solid evidence of remarkable innovation in isolated sectors of the academy. The fact is that the financial model of American higher education is broken. The revenue generated no longer supports the people, programs, and facilities that form the decentralized higher education community that is still admired globally. Something must be done soon. The answer will likely come from within higher education. My strong hope is that positive disruption arrives before consumer perception and the fiscal crisis intersect to do irretrievable damage. 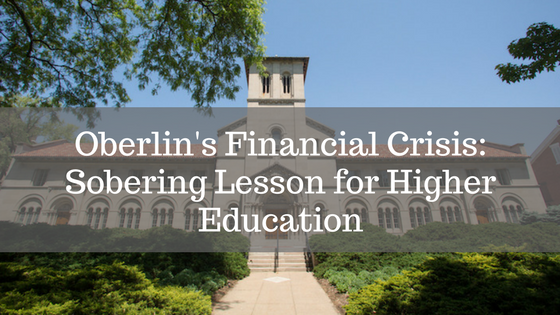 Last month, Rick Seltzer reported in Inside Higher Education about a brewing controversy at Oberlin College, which is facing a significant budget shortfall. The College, including its prestigious Conservatory, faces a multi-million dollar deficit caused largely by lower-than-expected enrollment. In response, Oberlin’s administration pledged to look for new revenue to reduce spending in the short term. This will encourage and permit development of long-term strategies to broaden its appeal to college-bound students, raise money through a new comprehensive campaign, offer early retirement plans, and place stricter conditions on funding for large capital projects. Is Oberlin’s Campus Culture Hurting Enrollment? There are two ways to look at Oberlin’s situation. The first is to criticize the school for getting itself into this mess, failing to educate its stakeholders about the crisis and not including them more directly in seeking a solution. Critics might argue that any financial changes must be more fundamental because Oberlin has a shaky financial model that will be subject to unanticipated cyclic downturns when some combination of enrollment softness, brand weakness, and fundraising failures and endowment shortfalls hit the College in the future. It is unlikely that Oberlin suffers from an enrollment shortfall, as some contend, because its faculty and students lean toward one end of the political spectrum, even if, in fact, they do. Oberlin appeals to students who are comfortable with the campus culture; indeed, it one reason that 27 % of those who are accepted in the college of arts and science actually enroll there. An alternative to criticizing campus culture for the current budget woes is to commend Oberlin for facing the tough questions that beset its peers and aspirants across the country. Most college leaders envy Oberlin, with its sterling reputation and a $770 million endowment upon which to base its decisions. What Oberlin should demonstrate to the rest of American higher education is that serious, purposeful, and inclusive conversations must occur if an institution is to avoid what many less endowed and recognized colleges already face – open concerns about whether they are sustainable. For most of higher education – public and private – the facts are clear. The operating model doesn’t work, especially if the college relies overwhelmingly on a tuition-grounded comprehensive fee. At all but a handful of colleges and universities, fundraising cannot keep up with growing demands on the budget. Fundraising is, at best, a long-term solution. Even with the run-up in the stock market, most institutions do not have endowments that are meaningful supplements to tuition revenue. Auxiliary revenues are flat and typically diverted to pay for academic programs that student tuition cannot finance. At the Division 1 level, for example, only one in eight athletic programs pay for themselves. And most colleges have already made tough decisions on creating basic efficiencies — either through short-term actions like salary freezes or on a more permanent basis, like modifying health and retirement plans. There is little wiggle room left in budgets that are largely fixed by labor and capital costs including debt repayment, facilities upkeep, and technology. There is almost no discretion left in many college operating budgets. Some colleges panic, surmising that a shift to new programs at the undergraduate, professional, or continuing education levels will keep the wolf from the door. Others are thinking more about online programming opportunities. It may be that a solution based on shifts, modifications, and new programming ventures will offset growing financial aid discounts and annual operating increases. It is more likely that such actions will delay the reckoning that will come when discounts make long-term survival an open question. In the end, what we need to hope for most is that colleges are nimble and creative institutions with long histories that survive the upheavals that they face as these venerable institutions have in the past. What’s so encouraging about Oberlin is that they are asking the right questions. The road may be a little bumpy until transparency improves, but Oberlin put its future on display to address systemic issues. And it did so before it had no choice. Change is coming to higher education. Each institution will find a different solution on a path to sustainability. But the solution will be about strategy, not tactics. In the end, the institutions that survive will not be protected by their money, alumni base, or reputation. They will prosper because they figured out how to remain relevant in the 21st century. Looking at older, retiring adults, Belkin suggests that universities could use the tuition payments and many of these older students pay full freight. In a telling statistic, the article relates that about 10,000 baby boomers are retiring every day. Colleges and universities are overwhelmingly dependent on the revenue that they receive from tuition, fees, room and board. Many are not reaching their projected enrollment numbers. Colleges face rising financial aid discount rates, now at 50 percent. The number of full-pay students has dropped precipitously in the past 20 years while the sticker price at high-priced tuition schools approaches $70,000 per annum. In addition, the demographics for the traditional draw of students within the 18-22 year old cohort are terrible with no significant improvement over the short term. The usual building blocks of admissions – academic-oriented admits, legacies, student athletes, over-the-transom acceptances, international students, and transfers — have not produced a robust applicant pool. Indeed, the problems creating a seamless pathway for groups like transfers are now considered a national crisis, with a great deal of experimentation going on at the state level. With the financial outlook so bleak, perhaps it’s time for many colleges and universities to re-imagine who they serve and how they contribute to workforce preparation in America. There will always be room for the traditional, residential liberal arts college filled with 18-22 year old students. But it’s time for the broad middle market of public and private colleges and universities to think of educating late-stage adult populations beyond graduate and continuing education programs that cater more to traditional workforce development than workforce re-imagination for late-stage career and retiring employees. It’s in this developing grey area of retiring baby boomers where Mr. Belkin’s reporting holds special merit. Is it possible that aging and higher education can intersect in new, imaginative and extremely practical ways to serve America’s workforce and enhance its productivity? Why should we lose the talent, entrepreneurialism, and creativity of retiring baby boomers, especially those who seek new professional horizons and carry with them a generation’s worth of valuable work experience? It makes practical sense for American high education to develop this market for a number of reasons. American higher education should be a seamless, continuous pathway that takes account of the full capabilities of its citizens. The current education formula trains broadly in the liberal arts, towards an end goal of employment after graduation, and for early- and mid-stage professional advancement. It does not provide workers in the later stages of their careers with an opportunity to match their professional interests with their life expectancy. The media is full of images of retiring workers who have planned well to live a life of contented comfort. But what about the millions of retirees who want something different than what a fully funded 401k fund provides – a chance instead to try something new, contribute to their communities, and remain relevant in their field if not at the same job? Is there really only one path to a meaningful retirement? This failure to account for a lifelong seamless educational pathway to address the full range of retiree interests further exacerbates the issues that arise in a post industrial economy that is moving faster than the educational system that develops its workforce. That’s not to say that there are not already programs that serve retiring baby boomers. Mr. Belkin cites programs at Harvard and Stanford, for example, to demonstrate the innovative programming already in place. Both programs provide an opportunity for accomplished professionals to take a moment before they try something new, often with potential global implications. Other colleges and universities offer similar platforms. Many more have “learning experience” on-campus and travel options open to most groups, especially alumni. But higher education is in a financial crisis driven by its dependence on insufficient revenue from a tuition-driven operational model. If tuition continues to be the foundation upon which college and most university budgets are built, doesn’t it make sense to find new segments within the enrollment market that can pay the bills and enhance workforce productivity? There are good and bad examples of the mounting disruption in American higher education. Rethinking who attends college, when they attend, and why they came effectively re-imagines the enrollment market for most colleges and universities. It will make better use of people, programs and facilities. It’s good and necessary disruption that can make higher education more sustainable in the long-term. Rethinking how to create a life-long seamless pathway directly addresses the core mission of American higher education – to serve the common good. There has always been a historic tension between America’s colleges and universities and the government, whether at the state or federal level. It’s unavoidable. Once the government began to fund students and institutions in the late 20th century, its leaders believed that they had a right and responsibility to oversee the use of those government funds. For most of the national trade associations representing higher education, three goals emerged. The first was to protect the level of state and federal support that higher education received from them. The second was to preserve and safeguard fundamental underpinnings like the tax-exempt status of colleges and universities. And finally, the third was to monitor and argue against excessive regulation. As government discretionary spending decreased — with debt repayment levels rising and deficit financing the order of the day — state and federal spending became increasingly less stable. Today, America governs at the federal level by Continuing Resolution, careening from one deadline to the next. At the state level, annual budget deadlines are seldom met unless mandated by state law. In a world of last-minute, lobbyist-infused backroom deals, it’s impossible to plan accurately and consistently on most college campuses. You never quite know how the cards will play out. In recent years, most in the higher education leadership have worried that, in the absence of discretion, the federal government will turn increasingly to regulation. The Obama years provide numerous examples to justify such concern. Further, the government seems to be in a never-ending dance over the reauthorization of the Higher Education Act, further complicating higher education’s relationship with an important partner. Since last year’s presidential election, many have slightly shifted their concern about the federal role in government. There seem to be a number of forces at work within the government that have heightened a sense of alarm. The first is that higher education does not seem to have the champions that it used to in the federal executive and legislative branches. To illustrate, the passage of the new tax bill was problematic. Two examples show why. Proponents suggested a tax on graduate scholarships that ultimately did not make it into the final draft of the bill. The effect would have been disastrous for graduate and professional education. Second, earlier tax bill drafts called for a tax on the country’s largest endowments, reportedly to encourage better use of endowment spending. Let’s set aside the obvious question about why a government that cannot govern or budget effectively is a necessary and sufficient monitor of higher education spending. In the end, it is what it is. The second is that there appears to be an active effort – in rhetoric and action — by President Trump and his supporters to diminish the stature of American higher education. Leaders of America’s major research universities have agreed among themselves to take more active public positions in an effort to counter souring public perceptions of higher education. Without a coordinated plan – and the support of their trustees and campus communities – there is likely to be a limit on whether their efforts will work. The third is that “America first” policies on immigration have a deleterious effect on many colleges and universities. America is the global leader in providing high quality education at any level. It attracts the best and brightest from around the world. The impact of quota policies – and the impressions created of them and held by international students and their families – diminishes the talent pool within the American workforce. It also decreases foreign tuition payments, the ability to sustain a global campus, and the intellectual exchanges necessary to keep the next great ideas coming. In an American workforce approaching full employment, the need for more workers – and the best educated among them graduating from American colleges and universities – will be a growing problem if a strong economy holds. Will the government at the state and federal levels continue to be a steady, reliable and consistent funder of higher education? Does the government still see higher education as integral to its sense of commonwealth? Lacking discretion, will the government turn to a stringent regulatory environment to enforce its political goals, however inconsistent they appear to be? Higher education would be well advised to have clear policy goals as we move forward. It must also look for ways to work with Congress and the Trump Administration to safeguard and advance its goals. But the days of concerns over money, taxes, and regulation levels are gone. While we can hope for the best, the willingness of the president to use executive action to change the regulatory environment is something that we are free to ignore at our own peril. It’s hard to imagine how deeply the policies of the Trump Administration will affect America’s colleges and universities. As a group, these institutions are already undergoing substantial disruption. The old financial models under which most of higher education operate no longer work. The current path for many of them is not sustainable. Many institutions face rising costs, deeper financial aid discounts, and dismal demographics. This is a time when enlightened state and federal policy could make an important difference, resetting the balance that would offer breathing space for colleges trying to handle disruption. Policies could even provide new opportunities for the most innovative institutions, those who are using disruption to become more sustainable over the long term. Drawn from different arenas, four policy directions illustrate how the wrong federal initiatives can wreak havoc on the American educational community. Federal immigration policy: Immigration changes, proposed or underway, have two important and debilitating effects on American higher education. First, the drop in foreign student applications cuts off a supply of the “best and brightest” global students into American universities. On a graduate and professional level, such policies diminish the pool of qualified professionals who add diversity and depth to the applicant base and form a pool of potential subsequent hires. Fewer international students decreases the revenue available to colleges and universities whose financial models depend on full-pay students to offset the deep financial aid discounting now heavily practiced on most campuses. Tax on endowments: On its surface, the proposed tax on endowments may seem noble. Federal officials want to make the money more available to offset high tuition sticker prices by forcing the wealthiest colleges and universities to increase scholarships to students. The problem is, of course, that many of these institutions already have the most enlightened and generous financial aid policies. An endowment tax would penalize these schools for being successful at using fundraising and endowment investments to support their existing scholarship aid and funding the resources and offerings that make them such attractive institutions. The argument makes no sense. Generally, an endowment must make some amount above its annual spend down and the rate of inflation in order to grow at a reasonable speed — perhaps somewhere around seven percent today. What happens in the years when the endowment returns falls below the break-even rate as it has most years recently (and sometimes quite dramatically)? Further, what is the incentive for colleges and universities to build their endowments with private support to a point where they subject their efforts to additional federal taxes? Finally, how much would the proposed endowment tax actually contribute back to the U.S. Treasury? Is it deficit reduction or politics at play? It’s not so much that 50-100 colleges are affected — out of about 4,700 schools nationwide — it’s more a question of why? Is the endowment tax an example of government policy determined by anecdote and polling? Tax on graduate tuition waivers: Does it make any sense to tax scholarship money? If not, then why does the Republicans’ proposed tax bill include a tax on graduate tuition waivers? Much of the existing student debt about which politicians complain is acquired when students earn graduate and professional degrees. Why increase their debt burdens? Elimination of tax deduction for interest on student loans: Under the current tax code, students save as much as $2,500 annually via the deduction on student loan interest. While only the House tax proposal contained this provision, there is always a danger that mischief can occur in conference deliberations. Politicians on both sides of the aisle have identified student debt burdens as an area of significant and growing economic concern. Why pass legislation that will make the situation worse? In previous years’ tax and higher education funding bills, colleges and universities worried about the level of funding for student grants and loans like the Pell Grant and the Perkins Loan Program. They diligently watched any effort to impinge on their tax-exempt status. And they took active positions on issues of daily concerns, like the burden of state and federal regulations. But this year’s legislative proposals are substantively different. Federal policies are beginning to intrude into who and how we educate our students, where we draw our students from, and how colleges can continue to make themselves affordable. It has long been assumed that given declining discretionary ability, the federal government would increasingly turn to regulation to enforce its policies. But now, the efforts seem more directed at reshaping our cultural environment through policies that cut across race, nationality, and wealth. College and university leaders need to watch the tax bill’s conference deliberations closely. It’s a confusing and troubling time as we watch politics, money, and cultural preferences collide in the name of tax reform. In a thoughtful commentary on Philly.com recently, Pennsylvania State Treasurer Joe Torsella, offered an insightful perspective on Pennsylvania’s #1 national ranking for most college debt per student, a dubious distinction. The level has reached $35,000 at graduation, or roughly the price of a fully loaded, full–sized new car. It’s a growing problem but not an insurmountable crisis. Mr. Torsella is correct to argue that Pennsylvania’s state government has failed to adequately fund public higher education, especially in the Great Recession years and thereafter. And he is right to decry the level of indebtedness compared to the average in other states. But on a couple of points, the national numbers confuse a part of the story. First, Pennsylvania has 90 private colleges and universities with sticker prices higher than the state-subsidized public tuition numbers. Second, the Commonwealth also has a unique category of schools – state-related – including the University of Pittsburgh and Temple University where tuition prices have been historically higher than their state-owned counterparts. And third, Pennsylvania has offset some of its high tuition public and private sticker prices through support for its PHEAA student aid program, among the most generous in the country. Collectively, these conditions affect the level of student debt. These differences aside, Mr. Torsella’s points make a great deal of sense. Pennsylvania was an industrial and manufacture powerhouse whose economy has shifted dramatically in the past 70 years. Today’s renaissance in Pittsburgh illustrates this point nicely. But for the rest of America, Pennsylvania embodies a state in the throes of transition, moving to a post-industrial economy that is largely shaped in its biggest cities and their “eds and meds” complexes. This is the point on which Mr. Torsella’s argument holds together best. Pennsylvania has an enormous higher education community, anchored by some of the most prestigious institutions in the country. The two questions that he raises on reform and reinvestment make sense. Now is the time to have the discussion. Conversations about public support for education must start with an understanding of the realities of how state government operates. It’s very hard to plan for a future when state funding is dependent on an annual appropriations cycle and competing political interests. Any action must be consensus-driven and benefit, at whatever level possible, from both legislative and executive branches. Further, any reform must include a willingness on the part of colleges and universities to see themselves in the mix of needed reforms. They must become more efficient and accountable. But what is missing from Mr. Torsella’s analysis is an understanding that Pennsylvania is neither a public nor a private college state. It’s both. The two are not mutually exclusive and their futures are intertwined. Philadelphia is home to Temple and to the University of Pennsylvania and Drexel. Pittsburgh is the home to the University of Pittsburgh and Carnegie Mellon. The conversation must be comprehensive. The agenda must be thoughtful and complete. Any overarching strategy in Pennsylvania must be linked to broader questions. In Massachusetts, for example, former Governor Deval Patrick made a critical investment in the state’s biotech community. Years later, the results have transformed the regional economy and precipitated a boom in metropolitan Boston that highlighted growing income inequality, rising housing prices, the need for public transportation improvements, and the importance of better basic education outcomes. While these are persistent problems, they are also the next generation of problems that growing post-industrial economies face. Greater Boston is a robust place because Massachusetts placed a bet on a rapidly expanding industry that pulled higher education squarely into its economic development and workforce preparation mix. An ambitious strategy to play to the strengths of Pennsylvania by using its extraordinary colleges and universities could increase access and opportunity and link the state’s disparate regions together. Its government leaders must better appreciate that colleges are also economic engines that fuel the state’s economy. What would rural Pennsylvania look like without its mix of public and private colleges providing jobs that have long since evaporated in once-booming industries in their areas? Pennsylvania already has a dynamic higher educator incubator in place. The model works in states like North Carolina, Texas, California, Georgia, Massachusetts, and Minnesota. It’s already operating successfully in cities like Pittsburgh. Yet as discretionary spending decreases, Pennsylvania state leaders have important choices to make. One must be to support public higher education better. The second must be to recognize that Pennsylvanians are in this together. It’s not just a public college problem. But it can become a opportunity to re-imagine how its colleges and universities can redefine Pennsylvania’s presence on the national stage.